" Strong Growth in Home Sales in March / Q1" is the headline of March issue of Toronto Real Estate Board (TREB) Market Watch. During the first 3 months of 2016, there were 22,575 homes sales in Greater Toronto Area representing an increase of 15.8%. 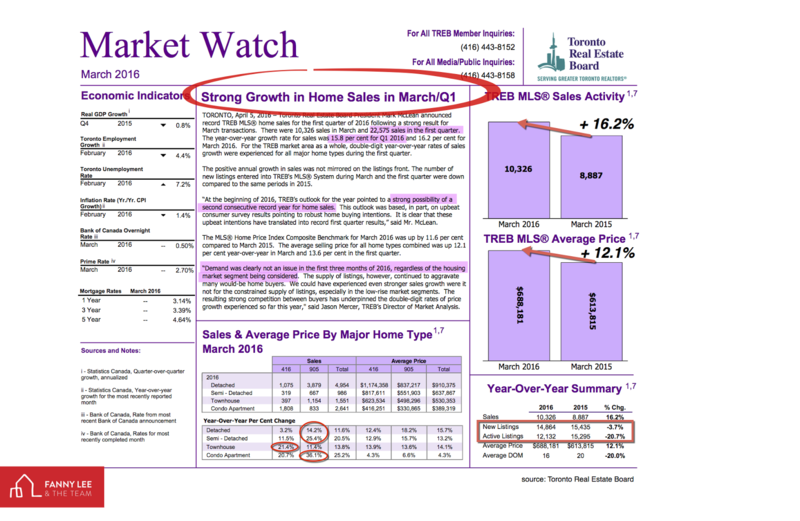 March sales rose 16.2 % in volume and 12.1% in price (average $688,161). The selling prices of all home types appreciated by double digits. Semi-detached and condo apartment recorded 20+% increase. Newly added and active listings are less than previous year, favourable to sellers. Based on the current trend, "demand was clearly not an issue in the first 3 months of 2016, regardless of the housing market segment being considered." " TREB outlook for the year pointed to a strong possibility of a second consecutive record year of home sales." If you are thinking of taking advantage of the active market to sell your property, contact us for for a free consultation and evaluation.